Yup, you read that right. Anything with salt + caramel + anything chocolate = heaven in my mind. If you have not already experienced pinterest then you are missing out on something that is highly addictive. This site has tons of recipes that people have "pinned" to their boards and I've book-marked quite a few that I want to try. One recipe would NOT get out of my head this weekend: the salted caramel brownies. I'll be honest, I normally try to make all of my baked goods from scratch, but when it comes to brownies, I just cannot get away from the Ghiradelli double chocolate brownie mixes. I did not use the brownie recipe that the salted caramel brownies called for, but used the box mix. All of the other steps were the same, including the making of the salted caramel. It was my first time making caramel and it got me SUPER excited for fudge season, which is only a few days away! Like the name suggests, it is quite salty, but once it was in the brownies I didn't notice it. Brownies look yummy even at 6:00 in the morning. I just came by to wish you a Happy Thanksgiving. Found your blog via the foodie blogroll. I am also a huge fan of the Ghirardelli Double Chocolate Brownie Mix. I have tried many from scratch recipes and couldn't seem to find one as good as their boxed version. 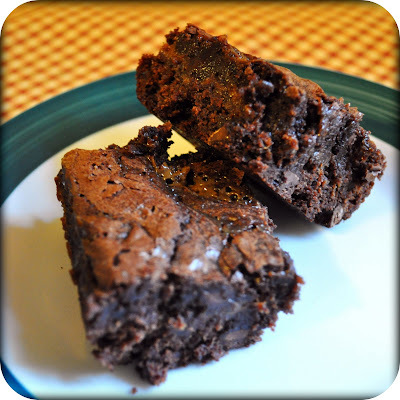 I finally found an amazing brownie recipe which I made and posted about but it requires some time in the kitchen. I will still go back to the boxed version for those nights where you just want an easy and yummy dessert.